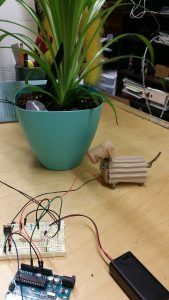 For this week’s project I made a dog that will let me know when my plants need water. When the soil is dry, Pantufla (the dog), will alert me by moving her tail, and moving. Once the soil gets wet, she will stop moving. To detect the level of the moisture I made a very low fidelity sensor using two nails.